Put butter in dutch oven and set over a couple coals to melt the butter. Combine all dry ingredients (first 7 listed) into a large bowl and mix together. Mix in cheese and peppers. Stir water, eggs, and butter into the bowl of dry ingredients. Mix thoroughly to make a smooth batter. Bake at 350 degrees. After 30 minutes, poke a toothpick in the center. If it comes out dry, it's done. If not, bake another 10 minutes. 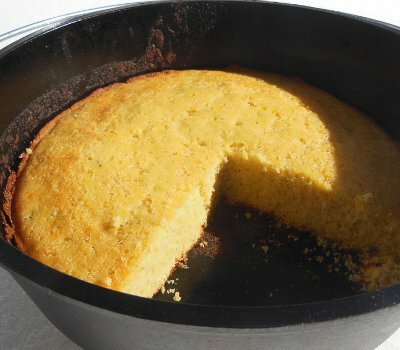 Let me know how you enjoyed your Spicy Cornbread!